The main window design allows quick switching from banking to budgeting without losing your place. Each view retains its own filters and sorting. The two main parts of the MoneyWell window that drive your content view are the source list at the left and the navigation bar at the top. To the right of the source list is your content list that holds your transactions, events, or bucket transfers. Above it is a header that gives you a summary of what is shown or selected in the main list. 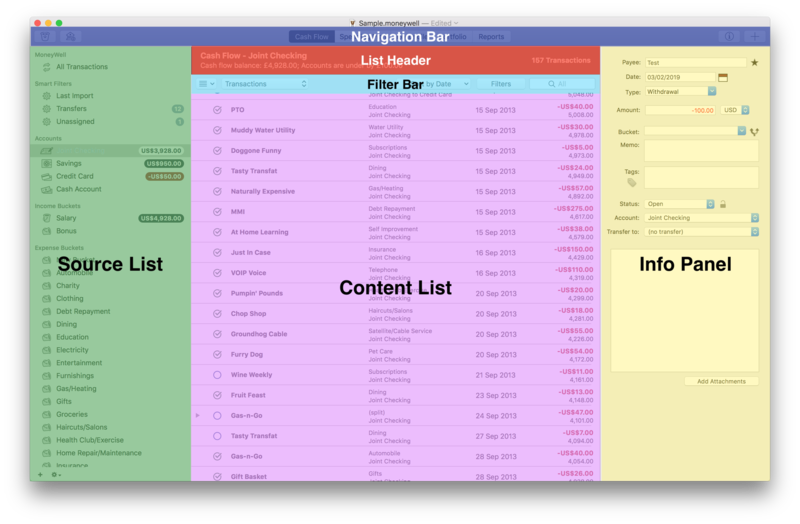 Below the header and above your content list is the filter bar, which gives you the ability to focus on specific data. At the top of the window is the navigation bar. At the left side of the navigation bar are the action buttons for the source list. The tab bar changes the content list and the buttons at the right are action buttons that affect content. The source list is your first stop for adjusting your content list. At the top of the list is the "All Transactions" item. Selecting it shows all the transactions for the selected view. Below that are sections labeled Smart Filters, Accounts, Income Buckets, Expense Buckets, and Securities. Any of these sections can be hidden using the Hide button that appears to the right when your cursor is over that section. To filter your content list, you can select one or more items in any of the groups. If a view can't handle a selection, it will simply treat it as if All Transactions was selected. For example, spending plan events are not account specific so selecting an account does not change the content list. Selecting buckets, however, will filter the events. Selecting more than one item in the source list can be very handy if you want to see your last imported transactions in your main account. Simply select your account, then hold down the Command key (⌘) and select the "Last Import" smart filter. This technique can be used for viewing any combination of source list items. The tab bar allows you to swap between five primary views: Cash Flow, Spending Plan, Reconcile, Portfolio, and Reports. To quickly navigate between these different views, hold down the Command key (⌘) and press the number keys 1 through 5, respectively. The left-side action buttons affect the source list and let you Fill Buckets or Download transactions to selected accounts. Fill Buckets isn't affected by the source list selection, but you can direct MoneyWell to only update specific accounts by selecting one or more of them prior to clicking Download. The action buttons on the right affect your content list. Click New to add transactions, events, or favorites, depending on the view selected. Click Info to toggle the right-hand info panel for editing the selected item(s) in the content list.